Todays review is the first of its kind on the blog, I have never reviewed a concealer before and that is mainly due to the fact that I don't wear concealer. Well, I didn't up until recently! While the old domain name may be gone, I am still a bargain hunter at heart so naturally I picked up one from a budget brand. I am probably the very last person on the planet to jump on the Collection Lasting Perfection Concealer bandwagon, this product has been hyped up for as long as I can remember. I can't scroll through feeds on my social networking sites without seeing someone rave about this product, as you can imagine my expectations were quite high. Sometime around the start of last year I bit the bullet and ventured out to Boots to finally purchase the concealer to see what all the fuss was about. Fair, Cool Medium, Warm Medium and Dark. There isn't a huge variety in terms of shades however I was pleasantly surprised with how pale the lightest shade '1 Fair' was. It matches my skin tone almost perfectly. When I realised the product only came in 4 shades I had assumed that the lightest shade would be too dark as that is usually always the case for myself, but not this time thankfully! With regard to the packaging its plain and simple, just the way I like it! The concealer comes in a clear tube with a black lid and text printed on the body. As you can see from the pictures above the top tube with the writing on it is a newly purchased concealer while the one beneath is one I picked up a couple of months ago. As the writing is imprinted on the tube and not engraved the text does wear off after a some time. I don't mind this at all because once my makeup is on, its on for the day. I don't carry around a makeup bag to do touch ups so nobody is going to see my worn tube of concealer anyway! After twisting off the lid you will be greeted by a doe foot applicator. I dislike sponge applicators when it comes to concealer as they easily collect bacteria and also soak up some of the product. I would suggest dotting the product onto a palette or the back of your hand and then applying it to the face as this will limit bacteria build up. Initially when I tried this product I detested it, absolutely detested it. When applied to the under eye area I found it aged me by about 80 years, lines I never knew existed suddenly appeared. I was so let down because there was so much hype surrounding the product. 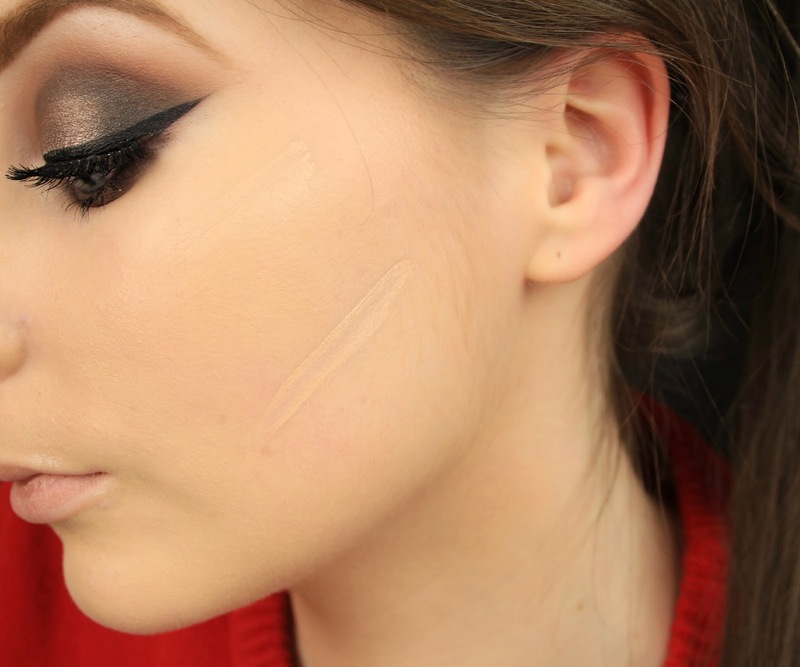 When I would see a YouTuber applying mountains of the product to their under eye area I would wince. I personally find the consistency of the concealer far too thick to be worn underneath the eye. After much disappointed the product was tossed aside up until recently. As you may know I do makeup tutorials over on YouTube and I'm also an avid viewer too. Time and time again I kept seeing YouTubers raving about this product and I simply couldn't understand it. In a bid to, I decided to root it out and give it another go. I was determined to make this work and after much use I finally found a way for me! I loved the coverage of the product, the shade, and the price. Unfortunately it was only the application side of things I was unhappy with. I found the product caked and creased underneath the eye and also around blemishes. Naturally using the concealer for these purposes was a big no no! I decided then to use the concealer to highlight certain areas of my face and it worked like a dream. I use the concealer on the top of my cheek bone and underneath the hollows of my cheeks. From the photo above you can see that the unblended concealer is almost a perfect match to the foundation I am wearing. I apply the concealer, blend it and then I set the area with powder. Once I have set the skin I can then apply my contour powder. When thats in place I sweep a little more powder underneath the hollow of my cheek to make that contour shade really stand out. Using the product in this way allows me to effectively sculpt my cheek bones and I'm quite satisfied with the end result. The concealer is extremely long lasting, I find it looks the same in the evening as it did when I applied it at the crack of dawn that morning. This product will set you back a mere €5.49 in Boots so it is extremely affordable. Although I don't use the product for the purpose intended of concealing imperfections/blemishes, I still thoroughly enjoy the concealer and will continue to repurchase.